West Coast won this game by being more efficient in attack. 12 more scoring shots from just six more inside 50's to give them a 10 point win. They outscored their opponents from Intercepts, scoring 6.14.50 to 4.5.29. Kade Simpson has set a new season record with 30 kicks in today's match, eclipsing the previous best held by Rory Laird (29) which he recorded against Richmond in Round 2. Andrew Gaff has been best on ground in today's match. He has 31 disposals from an even balance of 13 contested and 17 uncontested possessions. He also has six clearances, four score launches and two goals to go with a teamhigh 526 metres gained. Patrick Cripps has lead from the front as standin captain again in today's match. He has 33 disposals, 18 contested possessions, seven clearances and two score assists, all game-high's to go with 11 tackles, six inside 50's and 24 pressure acts. From 57 per cent time on ground, Nic Naitanui has continued to show he is on the way back to his AllAustralian best form. He won 26 hitouts including six to-advantage. He also has six tackles and three clearances as well as four inside 50's. Blues InterchangePatrick Cripps off due to the blood rule. With that goal to Harry McKay the Blues have made it 7.2.44 from set shots in today's match. They average a goalkicking accuracy of 64 per cent from set shots this season, the third-highest accuracy rate of any side in the competition. Jack Darling has six pressure acts this term (17 total), including two tackles, both numbers double that of any other player on the ground. Only Elliot Yeo has more pressure acts for the Eagles in today's match (22). Blues InterchangeCameron O'Shea and is possibly out for the game. Levi Casboult gets his first goal of the game and the Blues first goal in the final term to reduce the margin to 20 points. He has been good today as a relieving ruckman, winning 55 per cent of hitouts, the secondhighest win rate behind Nic Naitanui. Liam Jones has recaptured some of his best form today to keep the Blues in the match. He has been able to spoil 11 marking contests and take 10 marks, including four intercept marks to lead all players on the ground in each of these categories. Jeremy McGovern has nine disposals in today's match, seven of which have come from Intercept Possessions. He averages 9.5 Intercept Possessions per game in 2018, the fourthhighest average among all players in the AFL this season. Kade Simpson has recorded 24 kicks in today's match. This equals his best record for this season in this category which he recorded against Richmond in Round 1. Only four players have recorded more kicks in a match this season. The Eagles forward half dominance in the second half of this term has overwhelmed the Blues. They have recorded 12 of the last 14 inside 50's to score 3.5.23 to 0.0.0 in that time. Patrick Cripps is really giving everything he can to keep the Blues in this match. He has seven contested possessions, four clearances, eight pressure acts, all gamehigh's for the term, as well as eight disposals and three tackles. Jamie Cripps has been crucial to West Coast this term and their ability to get repeat inside 50's. He has four entries double that of any other player. He also has 140 metres gained, three intercept possessions including two forward half intercept marks. Matthew Wright has won the only offensive oneon-one contest of this term so far. Carlton have won 22 per cent of their offensive one-on-one's this season, the third-lowest win rate of any side in the competition. The Eagles through Nic Naitanui and Scott Lycett have won 11 of the 12 hitouts possible in the third term, including four toadvantage. However the Blues lead the clearance count 6-3 and lead 1.1.7 to 0.0.0 for scores from clearances for the term. After six disposals in the first half, Tom Cole has started the second half very well leading all Eagles with four disposals and three marks, including the launch of the Eagles only score for the quarter so far. After six inside 50's the Eagles finally get a shot at goal from their first kick inside 50 this term through Jake Waterman who registers a behind. After dominating the stoppages for most of this game, the Blues get their first goal from a clearance through Sam Kerridge. Carlton average 27 points per game from this source in 2018, the fourthlowest average of any side in the competition. Andrew Gaff was terrific for the Eagles in the first half, leading all players on the ground with 19 disposals, 317 metres gained, 11 uncontested possessions and eight contested possessions to go with five score involvements and a goal. Paddy Dow leads all players on the ground with five clearances, three from centre bounces (from three centre square involvements). He also has two sharked possessions and five preclearance contested possessions, one behind Yeo and Cripps (six each). West Coast recorded seven more possession gains than the Blues in the first half, but in scores launched from possession gains the difference is only six behinds. Zac Fisher has been outstanding for the Blues in the first term. He has 12 disposals, 245 metres gained, 10 pressure acts, three clearances and two inside 50's to go with eight contested possessions, a gamehigh in this category. Before that goal to Willie Rioli, the Eagles had kicked 2.7.19 from general play. They average 7.3.45 per game this season from shots at goal from general play, the secondhighest average of any side in the competition. 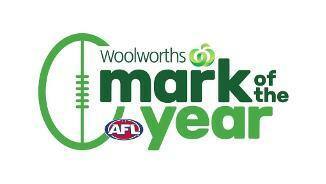 With that goal Carlton have kicked 4.0.24 from marks taken in today's match. They average three goals per game from this category in 2018, the lowest average of any side in the competition. After kicking at just 66 per cent efficiency in the first term, 11 per cent lower than Carlton, the Eagles are kicking at 80 per cent efficiency this term compared to Carlton's 70 per cent. They rank second for kicking efficiency in 2018 (71 per cent). Carlton have kicked two goals from 15 inside 50's (13 per cent) and the Eagles have kicked three goals from 18 inside 50's (17 per cent) in today's match. St Kilda are the lowest ranked side for goal conversion rate in 2018 at 17.7 per cent. Liam Duggan becomes the 96th player in West Coast history to play 50 games for the club today. 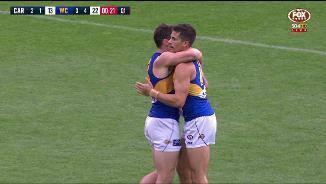 His first touch of the football today was the assist to give Shuey his kick for goal. 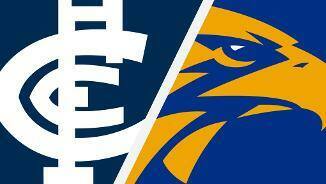 West Coast won 71 per cent of their defensive oneon-one contests in the first term. In 2018 they have won 33 per cent of their defensive one-on-one's, the third best win rate in the AFL in 2018. Essendon are ranked first in this category at 35 per cent. Kade Simpson was tremendous for the Blues in the first term. He leads the Blues with nine disposals at 100 per cent efficiency, six uncontested possessions, six marks, three possession gains including one that launched Sam PetrevskiSeton's goal. Carlton have recorded 15 preclearance contested possessions to the Eagles six, and lead clearances accordingly 10-4. Post-clearance however, the Eagles lead the contested possession count 23-10. Carlton came into the match with a mark play on rate of 40 per cent, the highest rate in the AFL in 2018. So far in the first term they have played on from 13 of 23 marks (57 per cent). By comparison, the Eagles are two of 17 marks (12 per cent). Tom Barrass has won two of his three defensive oneon-one contests in the first term. He ranks sixth in the AFL with a win rate of 44 per cent amongst the top 50 players for total defensive contests. 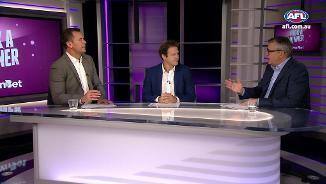 Paddy Dow filling in ably for Marc Murphy and Matthew Kennedy early on today. He has three clearances early in the first term for the Blues. No other player on the ground has more than one. Both teams have scored all their points from forward half Possession Gains so far in the first term. 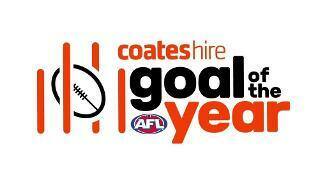 The Eagles rank sixth in the AFL for goals from this source, the Blues rank 17th in the same category. With Marc Murphy and Matthew Kennedy out for the Blues, Zac Fisher will be a player to watch around the stoppages. He ranks third at the Blues for groundball gets (27) and has the highest centre bounce clearance rate of any Blue (15 per cent). West Coast were ranked in the bottom four teams in the AFL in differential for hitouts and hitoutsto-advantage in 2017. In 2018, they average 37 more hitouts and nine more hitouts-to-advantage than their opponents, ranked 1st and 2nd respectively. Shannon Hurn ranks first in the AFL for marks (43) and in the top 20 players for uncontested possessions (69). He also ranks first at the Eagles for Effective Metres Gained (1631 metres) and third at the Eagles for Possession Gains (24). Carlton average three more centre clearances per game than their opponents this season, the secondbest differential of any side. The Blues also score 15 per cent of their points from centre clearances, the highest scoring ratio from this source in 2018. Welcome to MCG for the Carlton v West Coast Eagles Round 5 clash. WEST Coast has overcome a gallant Carlton outfit to post a 10-point win on Saturday afternoon at the MCG. 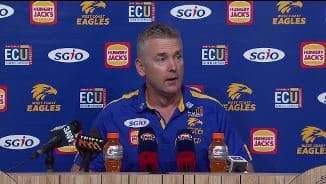 In doing so, the Eagles moved to 4-1 and were on top of the ladder at the time their game finished, and were guaranteed of being ensconced in the top-four by round's end. 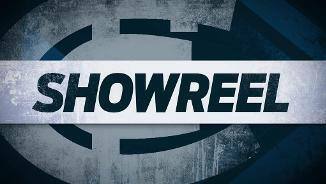 Comeback Carlton defender Sam Rowe, returning from a right knee reconstruction, was given the tough task on Josh Kennedy and held him to one goal, enough to tie Peter Sumich on the club's goalkicking list, with 514. West Coast's 10.19 (79) to 10.9 (69) victory consigned the Blues to an 0-5 start to the season for the first time since 1989. It was the Eagles' first win at the MCG since beating the Blues back in 2016. It was a frustrating day for Kennedy, who gave away a 50m penalty in the third term as he tussled with Rowe. 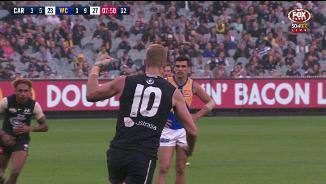 It seemed he broke Sumich's mark later that quarter when he snapped what appeared to be a goal, but Lachie Powman's insistence he had touched the football was deemed correct by the score review system. 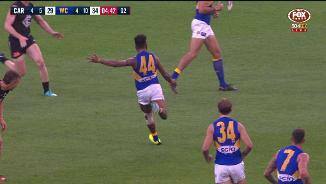 Willie Rioli once again excited, particularly with a brilliant effort in the second quarter when he worked hard to spoil Kade Simpson before receiving a handball, stepping around Patrick Cripps and slotting a classy goal. 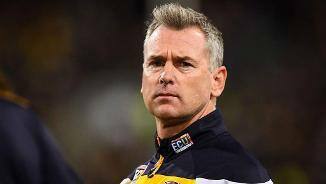 West Coast coach Adam Simpson was happy to bank the four points and head home. "It was a grind game. We anticipated that. 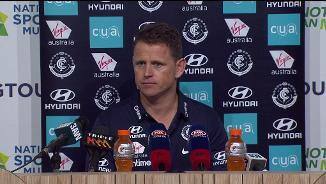 The suggestion they would be a walkover was ridiculous considering what Carlton are as a footy club, where they're at and the talent they have coming through," Simpson said. "We missed a few shots, couldn't break the game open but in the end we got the win." 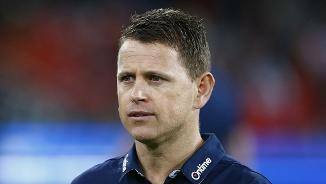 Brendon Bolton's brave Blues brought the attitude and effort that had largely been missing this year, but they lacked polish, fielding a team missing the top four from last season's best and fairest – Marc Murphy (left foot), Sam Docherty (left knee), Matthew Kreuzer (groin) and Bryce Gibbs (Adelaide). The game descended into a slog at times, which was especially the case amid a run of nine consecutive behinds during a patch in the first and second quarters. However, the Blues faithful would have been buoyed by the return to form of Liam Jones (16 one-percenters), who looked confident in the air, while young pair Zac Fisher and Paddy Dow supported the magnificent Patrick Cripps (34 disposals, 19 contested possessions and 11 tackles). Keeping the opposition under 100 points for the first time this season was another positive, although the Eagles helped ensure that happened by missing numerous chances. 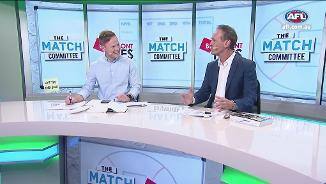 Bolton acknowledged the improved defensive performance against a side that was averaging 110 points per game coming into the clash but lamented his side's costly skill errors. "There were a few defensive 50 goals against that they kicked. You need to really concentrate in and around that," Bolton said. "Also, just some turnovers coming out of the back 50. I think you could envisage those. You give up some easy goals and there's the game, really, in terms of the difference." The appearance of Harry McKay had been long-awaited and, after a forgettable start, he finished with four goals that included a brilliant checkside set shot from deep in a pocket with about seven minutes left in the contest. Nic Naitanui was quiet, accumulating eight disposals and 26 hit-outs as Andrew Phillips surprisingly took the points in that battle. 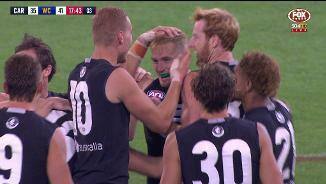 Carlton: Backman Cam O'Shea was the victim of friendly fire in the last quarter when he copped a knock to the head from Lochie O'Brien. 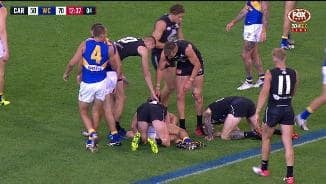 Cripps had a blood nose after an errant Scott Lycett right arm saw him leave the field with just under five minutes left in the match. 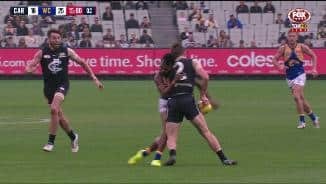 West Coast: Defender Brad Sheppard was hobbling briefly while diving to ensure a Dow shot wouldn't be a goal in the first quarter, but he played out the game. 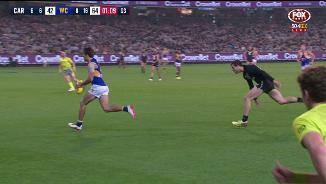 Rioli laid a big hit on Dow and went to ground holding his head, but came back on soon enough. Carlton will aim to win for the first time this season when they face the Western Bulldogs at Etihad Stadium on Friday night. Meanwhile, the first ever derby will be played at Optus Stadium when West Coast and Fremantle close out round six on Sunday week.